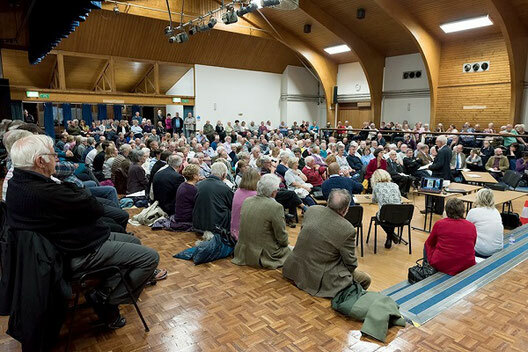 Over 400 people packed into Kidlington's Exeter Hall for the meeting hosted by the Parish Council (KPC)to discuss the Cherwell District Councils' proposed changes to the current Local Plan. Nigel Simpson, leader of KPC began by saying the Parish Councillors intend to oppose the proposals to allow 4,400 houses for Oxford City to be built around Kidlington. The first speaker was Michael Tyce from the Campaign for Rural England (CPRE). He reminded us that 75% of people surveyed want to keep the Oxford Green Belt intact even if that restricts the number of houses that can be built in the area. “Cherwell have failed to prove exceptional circumstances needed to take land out of the Green Belt which is still the highest and most difficult test in Planning” He noted that the part of the Green Belt North of Oxford is arguably the most important for preventing Oxford from urbanisation. Cherwell wants to put overspill housing in what arguably the least suitable location to take it. Doing so would be a travesty of Green Belt principles. 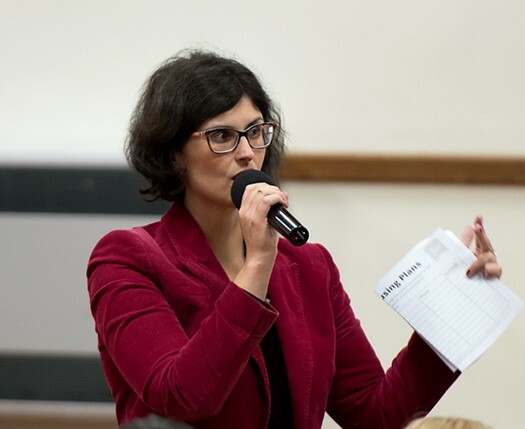 Layla Moran MP called on Cherwell DC to put the Local Plan on hold immediately pending the outcome of a current Government Right Homes in Right Places - Housing White Paper consultation which could result in halving the number of new homes the council has to build. She also voiced grave concern over the lack of supporting infrastructure and said that Cherwell DC had a duty to listen to the strength and depth of opposition. Andrew Hornsby-Smith drew attention to the likelihood that the proposed 4,400 extra homes would just be the thin end of the wedge. Cherwell DC’s proposes to allow housing to be built at very low density by taking far more land out of Green Belt than needed. This helped confirm villagers fear that the aim is to allow developers to create a massive northern urban extension of Oxford. Linda Ward from Kidlington Development Watch spoke about residents’ anger and anxiety over the threat of merging with Oxford. She explained that building 1000’s more houses won’t take the heat out of the local housing market. Oxford City ‘Nimby Central’ can and should cope its own housing needs by prioritising housing and stop allocating sites for new employment outlets. 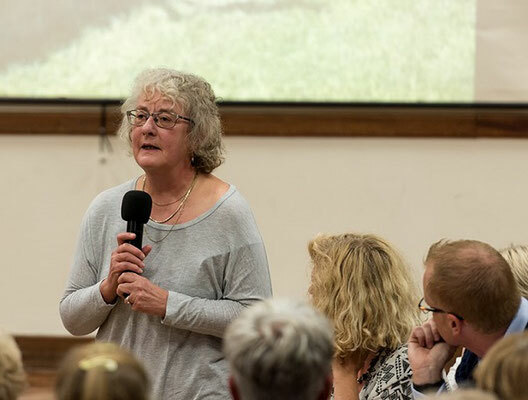 She urged everyone to object to the loss our Green Belt and Woodstock’s green fields. We should each defend strongly the specific sites we best know and love but stay united in our opposition and not promote alternatives elsewhere. “We’ve a duty to future generations not to sacrifice quality of life on the altar of unsustainable exponential growth”. The meeting was then thrown open for public questions and debate and a lively and passionate session followed. 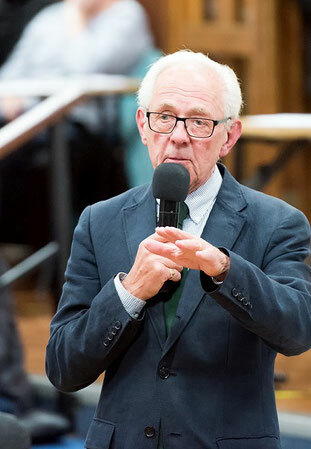 In the questions that followed much of the heat was focused on Cherwell's Clr Barry Wood for pushing Oxford City’s expansionist agenda over local interests and wishes. People asked: why he didn’t try to block the City creating over 5000 new jobs instead of putting housing at the N Gateway site? Does he really have any intention of listening to public objections? Why was the Golf course being sacrificed when the proposed site for relocation was completely unsuitable and already being earmarked to take 600 houses? What about the plight of young families on good London wages who can’t get on the Capital’s housing ladder and are forced to commute? Is the Council going to be creating new jobs that will pay workers enough to afford to buy a home nearby? 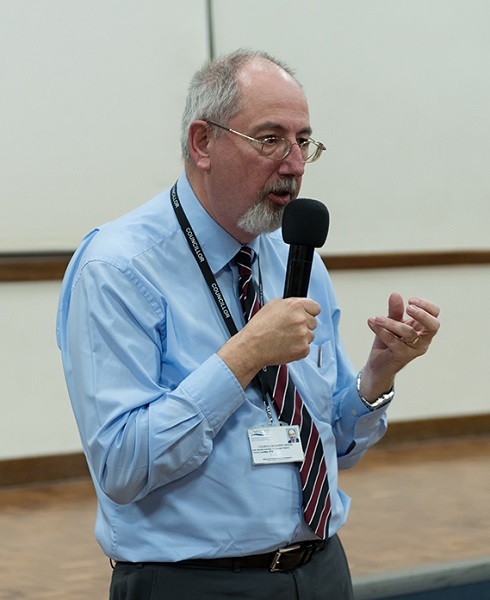 Councillor Barry Wood, Leader of Chewell District Council represented Cherwell District Council taking questions at the Kidlington meeting. He represents Cherwell on the Oxfordshire Growth Board. In response Clr Wood tried to explain the background, that if the Council’s didn’t help with Oxford’s unmet housing need it would face legal challenges aimed at wrecking the current Local Plan and a return to planning chaos in which development cannot be prevented. He said that it’s only natural landowners want planning permission that makes the land worth ~ £1million per acre which largely explains why the cost of a new house on green field is so exorbitant. There was more, but folk demanded he stop blustering and answer their questions. For me, the most extraordinary passage of the evening came when Clr Wood claimed he wasn’t overly concerned to learn the county’s current housing growth requirements might prove massively overestimated. They’d gone through a proper process to get the figures approved for use in the Local Plan. So the figures were legal even if they were wrong. Besides, this was old news. Campaigners have been telling him the figures were incorrect for the past four years. So what if the Government was now bringing in a new method of calculation based on projected local household needs? He was sure it would be possible to add on some extra growth targets or make other adjustments to the formula in order to keep the same target number as at present. Seemingly forgetting that Cherwell DC is well on course to build over 22,000 new homes Clr Wood told us about the plight of 1,000 families languishing on his waiting list for social housing the Council cannot provide. Some of them might be our friends and families so how could we object to building these extra 4,400 homes for Oxford City? He said that we needed to create more jobs as well as new homes. but tellingly was totally unable to confirm if these new jobs would pay significantly more than current ones so the workers would earn enough to live or rent locally. Against boos, heckling, slow handclaps and people walking out in protest the best the Leader of Cherwell DC gallantly offered this defence: ‘you have to understand we’re up against very rich developers who employ extremely good lawyers’. He finished by encouraging anyone who wanted to object to focus on proving the process Cherwell is following to authorise the Green Belt land grab could not stand up in court. As the meeting broke up many stopped at our stand saying they’d decided to object. Barry Wood’s performance seems to have convinced any doubters and renewed everyone’s determination to tell Cherwell DC to think again. Barry wood failed the public on the night he did not answer any of the questions and ignored Lala Moran's request to put on hold the plans until the government review takes place. He came across very weak and unsympathetic to people present. The upshot of the meeting; Cherwell DC is more frightened of the landowners and the developers lawyers than the residents. The plan for the housing is already approved through the backdoor it is only the location that is open to debate. Cllr Wood is a technocrat, no brain, no imagination, no reason, his attitude was I have done my job, everything has gone through due process, dare you to challenge it ! The gauntlet was firmly thrown back at us the local residents. Cherwell DC councillors need to t start looking after the interest of its Kidlington rate payers and not those of the University of Oxford City. Kidlington is already over developed for the very limited amenities and poor infrastructure causing havoc and increased accidents on the A34.